In April I bought myself a birthday present. One of the smartest buys that I have ever made. I bought the X-1 RAPTOR from the cool folks at Blackhawk!.com and I love it. As you know, I returned to school in February and found myself trucking around $350 in textbooks. I had a day pack that I use for hiking and it was quickly pressed to it's limit. As school progressed I found that I had to spend more time in the language lab to study. This mean that I had to hump around my Spanish textbook, workbook and notebook every day along with my Marine Science gear. My poor budget pack popped the chest strap one day and I knew that I needed something more serious. 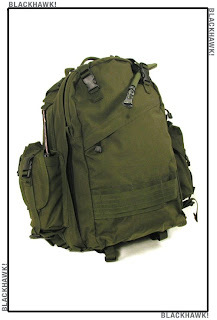 Since I've been researching my book I've become familiar with all kinds of military load-bearing equipment and for a while I used to wear web-gear when I hiked because it was perfect for day hiking and it scared the hippies. Sadly, my web-gear was stolen and I've used a $20 backpack to get around. I became aware of Blackhawk! from the Cav Store when I was looking for Nomex gloves (another story) and I sent away for their early catalog. Blackhawk! had great catalogs with cool pictures of Navy SEALs doing Navy SEAL stuff and they were the closest thing I'd experienced to the old Sears catalog as far as repeated cover-to-cover reading. So once I decided I was getting a new pack I gave Blackhawk! the first look. At first I thought that I'd go with one of their hunting packs because I wasn't sure how well a military-style pack would go over on a college campus. They make nice hunting packs but they didn't look like they could pull off the dual-role mission. So I looked through the combat packs and settled upon the X-1 because it was big enough but not huge and the price ($230) was in my range. I ordered it in Olive Green so it would be neutral, they make it in desert tan and Army MARPAT camo pattern but OG seemed the way to go. I ordered it with Next Day delivery but there was a snafu. I e-mailed customer service and they e-mailed me right back (within ten minutes) and explained the situation and told me when to expect my pack. Well damned if it didn't show up exactly when they said it would, so I was happy even before I opened the box. I used to be in sales and I'm big on customer service and Blackhawk! has that covered. They should be proud. So I open up the box and lay eyes on my new backpack. I have to be honest, it wasn't love at first sight but that would soon change. This thing has a hydration bladder that holds 100ml of water, I didn't know that when I bought it and I was concerned about how this would effect the load carrying capacity. The inside of the main compartment features straps to secure gear, I assume for silent movement on a mission and I wonder how they will factor in my stuffing this thing to the gills. So I load it up, I put all of my books in the main compartment and then put my Spanish dictionaries in the secondary compartment. Yes, that's right, it has a secondary compartment. I load all of my pens, pencils and reading glasses into the left side compartment. This compartment is clearly designed for M-16,M-4 magazines and features internal bands that are perfect for clipping my pens on. On the right side it has two thinner compartments. One that is clearly for a flashlight or maybe a sniper scope. I loaded a flashlight into that one. The second one is larger and has Velcro and an elastic chord, I assume this would be for either a radio or GPS or some kind of important piece of equipment that you don't want to lose. I stuffed a stapler, scissors and scotch tape into that one. Finally there is a small outer compartment that I stuff my cough-drops into. I assume you would put maps or MRE's in here. So once I had it loaded I waited until Monday to see how things went. Monday I grabbed my pack and headed out the door. I stuffed it behind the driver's seat and it sat there like a Sumo wrestler, very cool. When I got to school I hauled it out and slung it onto my back. Good fit. I went to tighten my shoulder straps and was surprised to find that I could do this easily. This is the heaviest amount of weight I've had on my back since my operation and while it's not a combat load or anything close it is heavier than my old pack could handle. The easy adjustment makes the load comfortable to carry since I can shift the weight into my sweet-spot. The pack has an innovative foam back panel that is ventilated so I don't sweat like a pig during the long walk from my truck to my class. It is just a damned comfortable pack to wear. As it turned out, it is also much larger than I first though. I have actually "Lost" my Spanish dictionary in it because I forgot which compartment I'd put it in. The pack is solidly constructed from 1000 denier nylon and breaks-in well. The compartments are zippered and pretty quiet. I've been hauling the pack around every day and I'm really happy with it, I cannot wait to get it out on a hike if for no other reason then it won't be as heavy as it is during school. I would argue that this pack has made my grades in Spanish go up because I can now hit the language lab every day without walking the quarter-mile back to my truck to swap out books. I think I'm going to have this pack for a very long time.